1. What are defective coffee beans? The coffee beans that are not good quality effects the appearance and they show up in the roasting process as soft, pale and molted beans which will definitely affect your good coffee time. Can significantly improve the green bean quality as well as the cup quality of the green coffee. What can Coffee beans can be categorized as defected? These problems could be solved, the most effective way is to sort either by two ways: manual sorting or electronic sorting. The process of removing defected coffee beans by a person is manual sorting. In manual sorting, the person has to sit in one place sorting them one by one with their hand. The process of removing defected coffee beans by machine is electronic sorting. In electronic sorting, the machine does the all the hard work. These machines have the laser to detect. 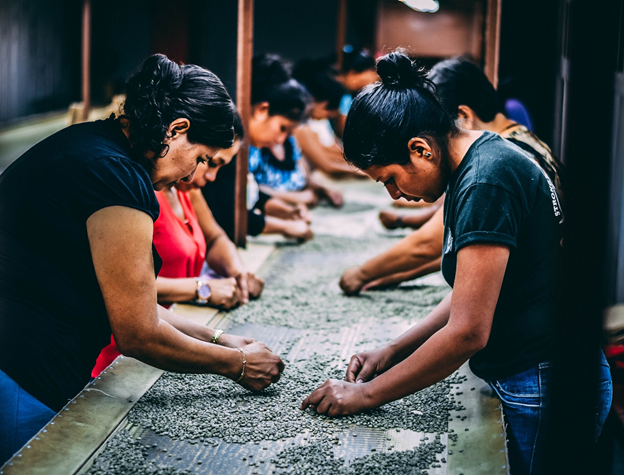 You might be interested: there are a couple of reflections on the social-economic model on the coffee sorter on the wiki. We introduced them after a discussion on the things you mention above, but also others, such as “sorting is in practice done by hand by people who are not even formally paid, like women of the house. A machine can free up their time, even if it does not directly save money”. How much can one worker sort per hour (under bad, average and good working conditions)? What do workers in manual coffee sorting earn? 10-20 wage examples covering different countries and different employers (family farm, coop, large business) will give us a good impression already. Converting the wages in PPP (purchasing power parity) in addition to showing the in the local currencies will help us comparing them. How many hours can a person work per day for sorting coffee, and how does it affect the speed and error rate of the sorting if people work more or less than this? When you find these, could you add them to your post above please? Much appreciated! How much does an optical coffee sorter cost if you were to buy one? I looked on a search and saw many models (all optical) but could not find prices. The cheapest ones are ca. 12,000 USD on Alibaba for Chinese models. Or 50,000 USD for a small machine from U.S. based market leader Satake in used condition (!). And thus the incentive to make an open source version. I had a talk with a commercial for a small sorter from an Italian company. The sorter was interesting, because it was a laboratory model, so much smaller than the ones usually found on Internet. Even like this, the weight was more than 100 kg. The sorter was able to sort something like one ton of beans a day. The technology was based on a black and white camera. The guy told me that when ejecting one bean, the sorter would probably eject more than one bean, due to the speed and flow of the beans. Huh that’s all much faster than my own 1-2 kg/hour Interesting! Could you add the links where you found this information? A kind of “literature list” at the end will do, no need to link every bit of information separately.